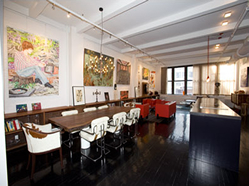 The listed space featured here offers a Live/Work office configuration that is two blocks away from the Flatiron Building. 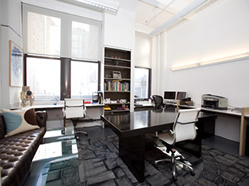 This loft office is located 20th Street in Midtown between Fifth and Sixth Avenues, centrally located between the East & West sides of Manhattan respectively. The office enjoys a classic loft form factor (dark hard wood floors + high 12.5' exposed beamed ceilings) that occupies the whole of the fifth floor. Because of the floor full presence the passenger elevator opens directly into the Reception Area which has room for seating your guests. This commercial loft contains all that is needed for a private business including; four Private Offices, a contemporary Reception Area, Conference Room, two Bathrooms, a Kitchen and separate Pantry, Freight Elevator, and a spacious open Work Area - plus "tons" of Storage Space within. 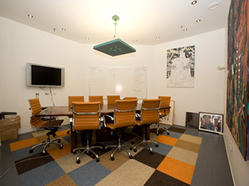 This office is situated inside a 11-story commercial loft cooperative building. The property is in the Flatiron District but close to both Union Square and Madison Square Park allowing for many transportation options for your staff and clients! 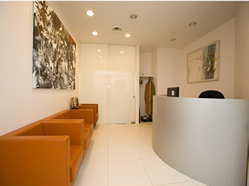 - Great Address just off of Fifth Avenue in the Heart of the Flatiron District. - Full Floor Presence, passenger elevator opens directly into the Loft. In the past decade, the Flatiron District has emerged as a trendy, vibrant neighborhood that appeals to businesses, residents and tourists alike. Technology, youthfulness, creativity and innovation are some words that capture the distinct flavor of the neighborhood. The Flatiron District's proximity to other great neighborhoods such as Chelsea, Union Square and Gramercy only makes it more enticing. The Flatiron's District's prestige affords local businesses an opportunity to play up their location in the realms of advertising and marketing. The Flatiron District is a neighborhood in the New York City borough of Manhattan, named after the Flatiron Building at 23rd Street, Broadway and Fifth Avenue. Generally the Flatiron District can be said to be bounded by 20th Street, Union Square and Greenwich Village to the south; the Avenue of the Americas (Sixth Avenue) or Seventh Avenue and Chelsea to the west; 25th Street and NoMad to the north; Rose Hill to the northeast, and Lexington Avenue/Irving Place, Gramercy Park to the east.